Last month we published the toughest news Buffer has ever shared—that a cashflow crisis caused by hiring too quickly forced us to make the hard decision to say goodbye to 10 teammates. Since we shared that news, we’ve been working to make many financial, accounting, and organizational changes and transitions needed to become stronger and more financially sound. We’re also actively searching for a finance director who can help us build a strong foundation and look toward the future with confidence. On the expense side, we spent $1.05m (-10.97%). The decrease in total expenses is a result of the layoffs we made following our cashflow crisis. However, because of severance pay, the full related decrease in salary costs does not factor in until July. *This is a forecast of our future salaries and hosting expenses. Salaries are based on a hiring plan that’s currently under review, so we might change some things here to keep these costs under control. **Modest growth based on regular monthly expenses. We don’t have any plans for large purchases (like reserved instances) for the remainder of the year. Expenses are just one side of the coin. Revenue growth is equally important to sustain our expenses and increase our bank balance. Happily, we reported our highest month-over-month growth of 2016 in June. We’re excited to have ramped up the number of growth experiments we’re performing, which we believe impacted this number. 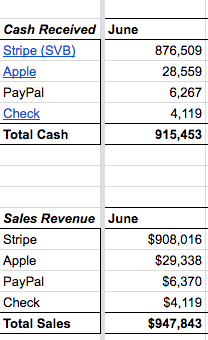 The month ended with $897k (+4.85%) monthly recurring revenue, our highest month-over-month growth this year. This gave us a total of $10.76m annual recurring revenue. Altogether, this gave us a $133k loss for June. We’re trying to operate as close to profitability as possible, so there’s a lot of room for improvement here. We’re currently reviewing expenses to see what we can change to get closer to these goals. Most tweaks that are being considered are around hiring costs (recruitment fees), a slower pace of hiring, and savings on subscriptions. Our bank balance at the end of this month was $1.22M (-9.51%) which is a step backward from our goal to be around $1.75M at the end of 2016, and $3.5M at the end of 2017. We feel great about sharing more financial data with you every month, but of course things can change fast. It’s important to us to stay accountable to you as we continue to work toward financial stability. For a real-time look at our metrics at any time, you can visit our transparent revenue dashboard. The dashboard contains the actual revenue numbers for Buffer, updated in real-time. It’s completely open for you to look around, view reports, and see how we’re doing minute-by-minute and day-by-day. It’s so important to all of us at Buffer to be accountable to you, our customers and community, in everything we do. If there is additional information you’d like to see in this financial report, please let me know and we’ll do everything we can to include it in future updates! Special thanks to Karim Osman for gathering all of this great information! I continue to be inspired by your openness with your financials. A true example for others to follow.